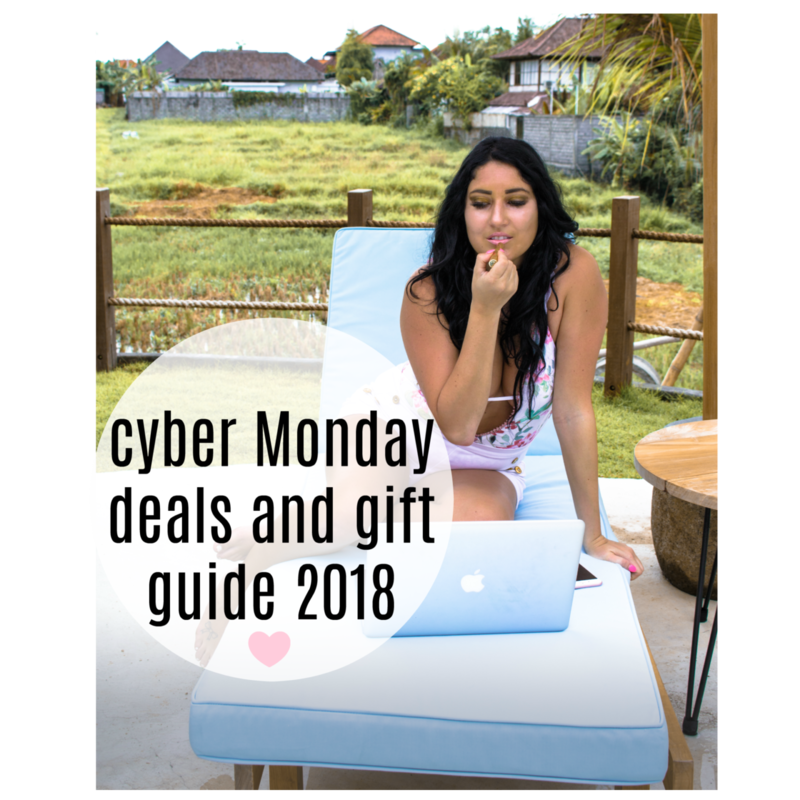 CYBER MONDAY GUIDE: WHAT I’LL BE PURCHASING AND BEST SALES! I can’t believe my favorite day is already here again! Cyber Monday is when I do pretty much all of my Christmas shopping for friends and family and…myself haha! I’ve never quite jumped on the Black Friday bandwagon nor do I plan to so Cyber Monday has always been a favorite of mine. I love cuddling up on the couch with a cup of coffee or hot chocolate all day and online shopping. It’s like my own little tradition. I literally make the whole day out of it. This year is a little bit different, however because I am in Bali for a social media course. You better believe I am still online shopping even from Bali, though. The only difference is instead of my couch I’m laying by the pool. I definitely can’t complain! This is a dream. I wanted to list some of the things I’m planning on purchasing for Cyber Monday and things that I’ve had my eye on, as well as sites that have the best deals through out the day. I will be updating this post through out the day as well. Jeffree Stars holiday collection: I’ve been obsessed with this alien themed collection since the day it dropped and I’m really hoping he’s got some good deals on it. Click here. Kylie Cosmetics Makeup: I haven’t bought anything from her line in a while so I’m excited to stock up on some things I missed out on. Also, she just came out with her super cute holiday collection! Right now they have 3o percent off site wide! Click here. Home decor from Amazon: there are so many things I’ve had my eye on from Amazon for my living room. Click here. Swimsuits from Beach Bunny: Since their suits are so expensive I usually wait until this day to purchase the separates that are usually on sale. Right now they are starting at $20. Click here. Nordstrom: Everything is up to 60 percent off until Monday at midnight! I’m super excited because my favorite swim company Isabella rose is also 40 % off! Shop swim here. Bauble bar: Right now they have 35 percent off their entire site! All of their collections and pieces are perfect for any gift. Whether it be for a friend or your girlfriend, etc. Click here. Bath and body works: One of my favorite holiday sales! Right now the 3-wick candles are only $12.95 PLUS sn extra $10 off with code “EXTRA10” Click here. Henri Bendel: They’re having a sale right now as well. All products are 30 percent off. Since they’re going out of business after the holidays now is your last chance to get everything you’re lusting over. Click here. Lulus: As if their prices weren’t already reasonable enough the site is adding 40 percent off to all items! Click here.